This article provides a practical explanation of the Type A Personality. After reading this article, you will have a basic understanding of this personality theory. What are Personality types A and B? Personality types A and B are two contrasting personality types originating from a theory developed by cardiologists Meyer Friedman and Ray Rosenman. 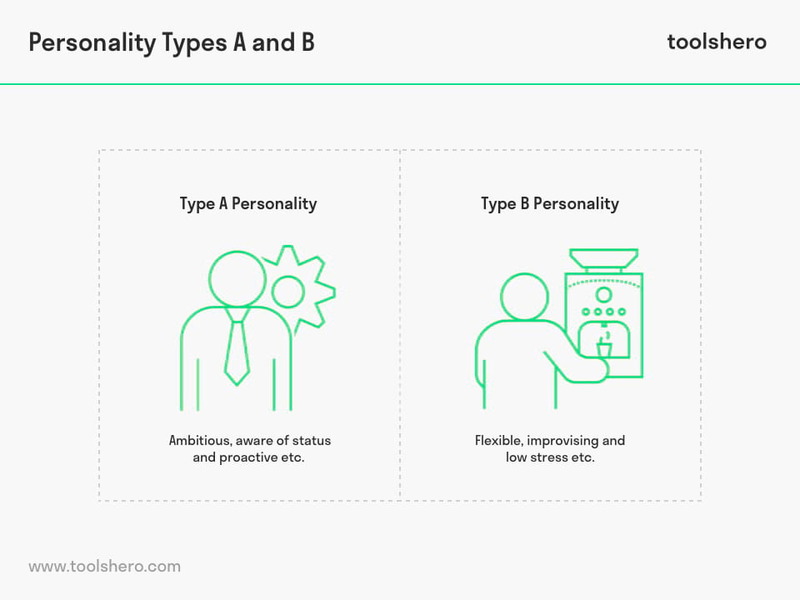 Type A personalities from these theories are more competitive, better organised, more ambitious, more impatient and more aware than personalities labelled as Type B. Type B personalities, on the other hand, are less susceptible to stress, take more time for most things, love socialising more and are more creative. Even though the type B personality is a significant part of the cardiologists’ theory, a lot more is known about personality type A. This is partly thanks to the tobacco industry. The Type A Personality is one of the two contrasting personality types from the personality theory that was developed by cardiologists Meyer Friedman and Ray Rosenman. The Type A personalities from these theories are more competitive, better organised, more ambitious, more impatient and more aware than personalities with the Type B label. The Type A Personality was discovered by accident by two cardiologists, after they realised that the seats in the waiting room of their practice wore more quickly than expected. The upholsterer then noted that the upholstery had worn in a rather unusual manner and told Friedman and Rosenman that he’d never seen chairs that wore out like this. Contrary to other patients, who kept to their seats while waiting, the heart patients appeared to be more nervous and often jumped up or were at the edge of their seat. Five years later, they started their formal study and typified this behaviour as the Type A personality. The two cardiologists who developed this theory believed that Type A personalities had a higher chance of developing coronary heart diseases and often had higher blood pressure. The relationship between Type A personalities and coronary conditions was partly or wholly rejected by some following the results of extensive studies. Nevertheless, this study had a significant effect on the development of health psychology, where experts investigate the relationship between an individual’s mental state and physical health. Although Friedman and Rosenman called this Type A Personality, it is nowadays conceptualised as a range of behaviours that are collectively known as the ‘Type A Behaviour Pattern’ (TAPB). People with Type A personalities are often driven workaholics. They push themselves with too many deadlines and do not cope well with delays, ambivalence and inefficiency. Therefore, punctuality is very important to these people and they expect others to be just as punctual as they are. In extreme cases, these people will develop a hate for those who speak or work slowly. They become irritable and restless when they have to wait in line or are delayed by chaos. The restlessness is a reason that people with a type A personality are more often confronted with burnouts. Money forms an important part of the lives of people with this personality type. In their experience, money represents security and power and they sometimes think that everything is for sale. People with a type A personality base their relationships on money, spend money to display affection or interest and often think in terms of money. The superiority complex these people may struggle with has unpleasant consequences for their private life, particularly for their relationships. The partners of these people must accept that work is more important than the relationship. Type A people often struggle to find a partner as they set high standards for themselves, but for their partners as well. Moreover, it’s difficult for them to relax and they prefer to work alone rather than be sociable. They consider displaying emotions to be a sign of weakness and they believe that emotions are an obstacle that will hinder them in achieving their goal. In their work life, people with a Type A personality experience more work-related stress and less fun in the work they do. They tend to get upset about little things and don’t tolerate unfinished work, chaos or loud noise. They have a typical short temper and can sometimes be blunt and rude. They are often characterised as selfish, which stems from their self-guiding ability and motivation to strive for and achieve personal goals. Try to relax and slow down every once in a while. Extreme competitiveness practically always leads to stress so try to avoid this. Make time for family, watch a movie or take a holiday? There are major differences between personality types A and B. People with a B personality are patient, easy-going and take time for many tasks they perform. These people are less susceptible to stress and think longer before they act. Type B personalities love socialising and enjoy being in the company of both people they know and strangers. People in this category often do not have a lack of attention either. In a professional setting (at work), they prefer comfort over success and are therefore known to have a better balance between work and private life compared to type A personalities. Type B personalities are often highly creative and do not get stressed out by a lack of achievements. Because type B personalities are not as affected when they fail to meet their goals, they are not afraid to fail either. This has the advantage that they are more comfortable when it comes to experimentation. Generally speaking, these type B personalities are innovative and love to explore concepts and ideas. ‘Participating is more important than winning’ is a feeling this personality type often expresses compared to other personality types, who are generally more competitive. It were Friedman and Rosenman who contended that TAPB was a risk factor for the development of coronary heart diseases (CHD). This theory appeared to be confirmed by the findings of the Western Collaborative Group Study that researched the relationship between TABP and mortality in the ’70s. However, it soon turned out that the positive findings were exceptions. The many studies that followed didn’t show any strong and consistent evidence that confirmed the possible connection between TABP and mortality. Despite the lack of evidence that TABP was actually a risk factor for CHD, this personality was of great interest to the general public. This interest was encouraged by Friedman and Rosenman who wrote books on how to recognise this ‘deadly’ Type A behaviour in yourself. TABP truly became popular following flawed studies that were financed by the tobacco industry and were intended to cover up statements on the harmful effects of tobacco and discredit these. The tobacco producers foresaw a decrease in the consumption of tobacco because proof that smoking was harmful was growing stronger. When it seemed that TAPB was a possible risk factor for CHD, cancer and other afflictions that are also caused by tobacco use, the tobacco producers promoted the role of TAPB in heart conditions and financed Friedman and Rosenman’s studies. In a self-made film, the Tobacco Institute concluded that smoking is a symptom of cancer rather than its cause. The argument was that cancer and coronary diseases could be caused by someone’s personality and not exclusively by smoking. Although this isn’t the most solid argument to cover up the negative effects of smoking, it was enough to defend the tobacco industry in court for years. Documentation shows that scientists were paid to work as advisers in the interest of the tobacco industry and experts were persuaded to defend and promote smoking. Strategies, such as Project Whitecoat, were also invented, in which scientists were aimed at downplaying the health risks of passive smoking. The Type A Personality often has a negative image. The theory describes that people with this personality type often have a great work ethic and unrealistic sense of urgency. Quantity is often more important than quality for this type, and they are more susceptible to burnouts due to their restless nature. Money and career are prioritised over relationships, and due to their short temper, these people can be rude, aggressive and blunt. People with this personality type are often competitive, capable at time management and set high goals for themselves. Friedman and Rosenman called this type deadly, which led the tobacco industry to deny the role of smoking in coronary diseases in order to stimulate consumption. In many ways, personality type B is the exact opposite of personality type A. People with this personality type are generally more relaxed and experience less stress. They enjoy their time more and can more easily postpone things until the last moment. They are also more patient, creative and tolerant. Type B personalities are easy-going and do not get angry or annoyed quickly. They are able to control their emotions better than people with personality type A. What do you think? Do you recognise the explanation of the Type A Personality? Do you recognise characteristics of this personality type in yourself or others? 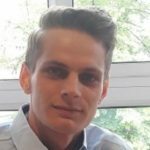 Do you think you can raise the bar for yourself after reading the explanation of the TABP? Rosenman, R. H., & Chesney, M. A. (1980). The relationship of type A behavior pattern to coronary heart disease. Activitas nervosa superior, 22(1), 1-45. Sager, J. K. (1991). Type A Behavior Pattern (TABP) among salespeople and its relationship to job stress. Journal of Personal Selling & Sales Management, 11(2), 1-14.